Professor Salwa Karboune is a graduate from the University of Marseille, France, in Food Biotechnology. Her main research expertise is in the design and development of new "green" approaches for the synthesis of novel functional food ingredients that can improve the quality and the functionality of food products. Her research program is based on a multidisciplinary approach combining food chemistry, enzyme technology and nanotechnology and focuses on carbohydrate-based bioactive molecules. Such a research is important as the structural and molecular roles of oligo/polysaccharides in biological systems are increasingly being recognized. Her research work also contributes to the sustainability of the Agri-Food sector by developing innovative biocatalytic approaches to generating highly added value functional ingredients from food-processing by-products. Her multidisciplinary research program has garnered national and international recognition through the sustained excellence of the research her group conducted. Her research has attracted funding from CFI, FRQNT, NSERC and MAPAQ. As part of her R&D collaboration with industries, she has led NSERC Engage and CRD grants and has partnered with MITACS. The research of her group has been covered in media, such as McGill Reporter, CBC and Journal of Montreal. At the national and International level, she is a committee member of the CFI Science Advisory Board, CIFST’s Scientific Expert Council, and the European Innovation Commission Advisory Board. In 2015-2016, she chairs the NSERC Scholarships and Fellowships Selection Committee for Plant and Animal Biology. She also serves on editorial and advisory boards for journals in her field. 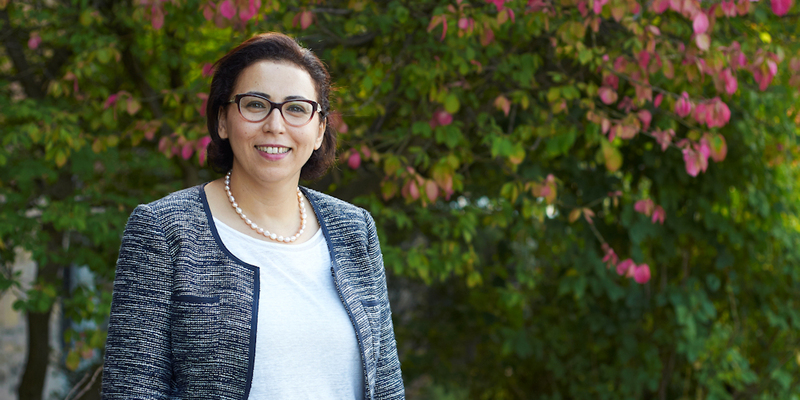 Professor Karboune is passionate about science and active learning, and she is a strong supporter of hands-on projects. She successfully mentored teams of students to first place prizes at the prestigious IFT Food Product Development competition. European Innovation Commission, Belgium, 2011. Comité ECOS-Nord, Université Paris, France. Mitacs’ evaluation committee for Accelerate internship proposals, Canada. INAF, Institut des nutraceutiques et des aliments fonctionnels, Université Laval, Québec. Committee Member, CIFST's Scientific Expert Council, Canadian Inst of Food Sci and Tech. Committee Member, Canadian Food Innovators Science Advisory Board, Canadian Food Innovators. Committee Member. NSERC Scholarships and Fellowships Selection Committee for Plant and Animal biology. 2013-2015. Institute of Food Technology (IFT), Professional Member, USA. Canadian Institute of Food Science and Technology (CIFST), Professional Member, Canada. American Oil Chemists' Society (AOCS), Member, USA. Club of Bioconversion and Organic Synthesis (CBSO), Professional Member, France. Nutrition and Food Science Centre, Canada. Dr Karboune’s research program aims at transferring novel findings emanating from bioactivity research to practical applications through innovations in sustainable biocatalytic processes to synthesize well-defined functional ingredients. The overall goal is to develop new sustainable processes and functional food ingredients from abundant biomass to meet the consumers’ needs of healthy diet. The focus is currently put towards developing novel functional food ingredients supporting intestinal health such as prebiotics and phenolated oligosaccharides to achieve desired gut microbiome phenotypes. Current projects, under-investigation in our laboratory, are listed here below. Development of an innovative enzymatic glycosylation strategy based on levansucrase-catalyzed transfructosylation reactions for the synthesis of hetero-fructooligosaccharides and polyfructosides having enhanced prebiotic effects and other physiological properties. Investigation of the synergetic actions of levansucrase and fructanase for the enrichment of maple products with controlled-molecular-size β-(2-6)-fructooligosaccharides with high colonic persistent prebiotic activity. Exploration of the properties of selected biocatalysts immobilized on nanoparticles in a little-explored transitional region between heterogeneous and homogeneous catalysis. The regioselective acylation of oligosaccharides with phenolic acids by feruloyl esterase using nano-emulsion systems to produce phenolated oligosaccharides. Modulation and optimization of the glycation of selected proteins (lysozyme, Potato Proteins) with mono-, oligo- and polysaccharides to improve their physico-chemical and functional properties. Development of innovative biocatalytic approaches for the biogeneration of polysaccharides, proteins and non-digestible oligosaccharides from potato by-products. Developing enzyme-based strategies aiming for selective and efficient routes towards functional ingredients from abundant cranberry by-products. The results of these projects have implications in various fields as biotechnology, food science and industrial processing.